What’s Going on With Lakefront Trail Separation? I’ve heard a lot of grumbling about the Lakefront Trail separation project lately. Some people are annoyed that at Montrose both cyclists and pedestrians are now detoured a block east to an underpass to facilitate driving to the beach, instead of trail users being able to make a direct street crossing. Others are upset that sections between Montrose and Fullerton have been torn up by construction for a few weeks now. One bike advocate who lives in Lakeview even told me he’s moving out of his apartment because he’s fed up with not being able to use the trail as a commuting route. While most of the project-related irritations are temporary, let’s keep in mind that by separating pedestrians and cyclists and/or widening the trail, the initiative will generally make the facility a safer, more relaxing place to stroll, jog, skate, and pedal in the future. For those of you who are getting impatient with the construction, which is supposed to be completely finished by the end of the year, here’s a progress report. The trail plan south of Roosevelt. Red is the pedestrian route, blue is the bike route. Last week the city announced the start of trail separation work from 31st to Roosevelt; the work is slated for completion in late fall. Work on this segment began at the Museum Campus and is moving south along Burnham Harbor. The northernmost section basically involves making and signs to shepherd people on foot and bikes onto separate existing routes, with cyclists remaining on the trail and pedestrians using a waterfront promenade. South of McCormick Place, workers will be tearing up the trail to make room for marking separate pedestrian and bike lanes, so the path will be closed during construction. The trail plan near 63rd Street Beach. Separation between 71st and 55th was supposed to start in mid-September and finish by the end of the fall. This will largely involve widening or adding a side path to the existing trail, so this segment will also be impassible while the work is going on. Work on widening the stretch between Oak and North began in the spring and is scheduled for completion next month. A concrete promenade for pedestrians has already been built on the beach side of the Oak Street underpass. During construction, sections of the trail have been reduced to an eight-foot-wide path shared by pedestrians and cyclists. The plan near Belmont Harbor. The segment between Fullerton and Montrose has been under construction since August and supposed to be finished by late fall. The path is generally being widened here and/or having a new side path built, although at Belmont Harbor pedestrians are simply being directed to an existing waterfront promenade. Here’s a map of the recommended detours while the trail is closed for construction. While it’s understandable that many of us are frustrated by not being able to use our accustomed commuting or recreational routes, patience is the watchword. Next summer all the excavation and paving should be a mere memory, and cruising the lakefront will be a much more chill experience than it was under the path’s previously congested state. I’m mainly unhappy that the detours are on gravel. Also, it still seems like there are still lots of pedestrians on the bike path. Here’s my question: The northernmost stretch of this new construction shunts bikers onto the skinnier waterfront section, and gives pedestrians the old, wide section. The part that’s now for pedestrians has lots of “NO BIKES ALLOWED” signs on it, while the new section for bikes is full of signs telling us to watch out for the pedestrians that are allowed to be there. So, pedestrians are encouraged to use whatever part of the path they prefer, but bikes are only allowed the narrow section? 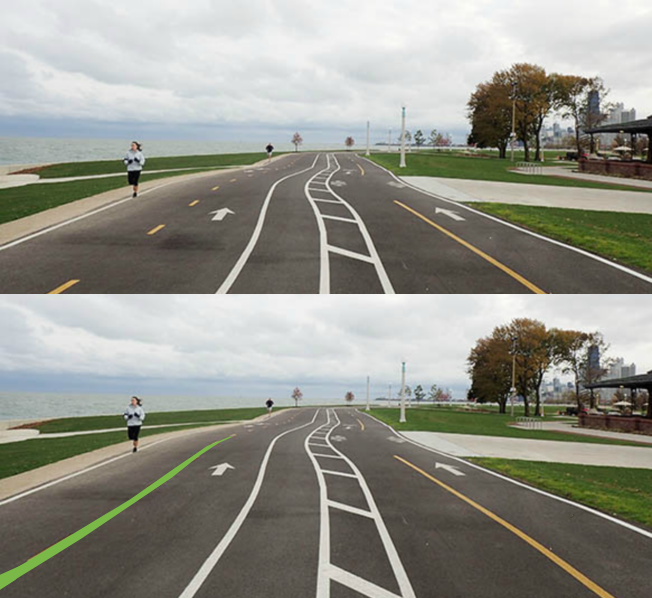 Did the city just low-key delete a chunk of the lakefront path for bikes? If the city’s welcoming pedestrians onto both sides of what used to be referred to as a bike path, I’m having a hard time seeing why I shouldn’t just stick to the safer, wider part. A small investment in repairing the sidewalk near Belmont Harbor would have been really helpful. The pavement was hugely potholed and rough — not safe for strollers etc much less bicycles. It was the lack of planning that made it so bad. I’d rather see the bike path for transportation along the Lake Shore Drive and forgo the “more scenic” route along the lake, between Ardmore and Montrose. The pedestrian traffic is for recreation and exercise. Bicycle traffic is used a lot for commuting. I’ll trade the shorter route for the more scenic route. 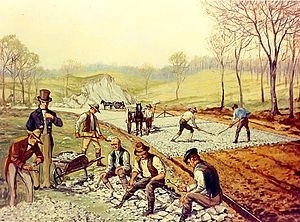 I wish that the concrete sections would be replaced with asphalt. One question, where are inline skates, skateboards, and kick scooters supposed to ride? Personally, I’m willing to recognize it takes less effort for a cyclist to travel a mile than a pedestrian, and I can deal with a longer route as a cyclist as a result. That said, pedestrians obviously want to walk near the lake. Putting cyclists on a part of the path that pedestrians are naturally going to want to use to get better views is just a recipe for problems. Form over function appears to have ruled the day. I would absolutely love it if instead of bike/ped markings they switch to rabbit/turtle markings. I generally support all the routing, but the part that has me most perplexed is the decision to route pedestrians around Morrie Mages Park at Sheridan. This adds in two 90 degree turns to the route. It seems like there is enough room to widen the primary path to make lanes for both types of traffic. Unfortunately, I think the City is in a catch-22 in terms of warning signs on the cycling parts of the path. Put the signs up, and face a backlash from cyclists that feel misled on how the path is being designed. Don’t put the signs up, get sued by a tourist who claims the City didn’t do enough to warn cyclists to watch out for pedestrians when someone gets hit by a cyclist on the path, even though the City “knew” pedestrians would end up in that area. I think this has as more to do with us being a very litigious society rather than any sort of plan to limit access for cyclists. I think the trail separation project is a great development in general, but the design of the portion from Montrose to Foster is pretty unfortunate. Sending bicyclists a half-mile out of their way permanently by routing them far to the east around Cricket Hill and then even further east to the edge of the lake is not a sustainable option. If someone is just riding for a nice evening out it may be fine, but for a north/south daily commuter or someone riding for transportation, a half mile detour adds five minutes more riding time, or ten minutes round trip. That adds up to an extra 50 minutes of commute time each week for a daily commuter. Furthermore, posting of “No bikes” signs along the one-mile stretch of the new “peds” path from Montrose to Foster doesn’t make sense, given the number of destinations immediately next to that path, including numerous soccer fields, baseball diamonds, a skate park. Is the park district mandating that people aren’t allowed to ride bikes to those destinations? Or that they have to walk their bikes for long stretches on the new “peds” path? How about the people on bikes who want to exit or enter at Wilson? Those signs invite pedestrians to scold bicyclists who do opt to ride on the “peds” path, as I’m sure many will do. The problem with the underpasses at Montrose and Wilson isn’t the block detour. The problem is the lack of a connection between the LFP and the popular east/west routes on those streets. One bike advocate who lives in Lakeview even told me he’s moving out of his apartment because he’s fed up with not being able to use the trail as a commuting route. Bahahahaha – imagine living west of the river. ^^^ Ope, I should have checked my math prior to posting. At 12 mph, a bicyclist covers a full mile in 5 minutes, so the extra half mile adds 2.5 minutes per ride. Still. Those extra minutes somehow seem to take a really LONG time when I’m riding the new path. or so far North you have to drive South to the LFT. I halfway admire and loathe those who bike on Sheridan. I totally agree it should be made accessible for biking AND faster bus movement but it isn’t and you’re slowing down the buses and risking your life when Glenwood Ave is one block over. Then as a Lake View native now living west of the river and expressway near Belmont, this resembles cutting off one’s nose to spite one’s face. All you need to do is go through the park to jump on at Fullerton, that stretch is not stressful in the least. Come ride Belmont from Kedzie to Western and then we’ll talk about what being fed up actually feels like. The connections exist, the issue is that there is not signage to tell people about them. What’s the intended connection from the path to east bound Wilson? All I’ve been able to figure out is riding up this sidewalk (https://goo.gl/maps/JiMchfMPrnz) and cutting through the parking lot. That route is even dumber when you consider that the pavement that would connect to the new off-street path under LSD would require going over this curb (https://goo.gl/maps/4r13kCkAguz) that was just redone without a ramp. And they go a block and then filter you back into traffic. Agreed, I think the entire path north of Montrose is terrible aside from the last stretch. They put the bike path through the back of the park, where it’s pitch black in the evening for 1/2 the year, homeless people have already set up tents, and you go through a park in between a parking area and a concession/rental area. It is NONSTOP people walking or standing in the trail the entire back stretch by the park. There are kids playing in the trail, or beside it and running into the trail. Ridiculously bad design. They need to use and listen to people who actually cycle, but hey, it added half a mile to the bike lane stats so Chicago can have a padded ranking. There is no point making a separated path if they aren’t going to heavily mark it and ENFORCE it. Get walkers off the bike-only paths, and vice versa, although I’ve seen few bikers on the walking trail, which will surely increase when prime Divvy season rolls around again. I’ve done almost a thousand miles cycling this summer, and some (far fewer) running, and it’s not even close, far, far more pedestrians are in the bike lane than bikes are in the pedestrian lane. Joggers would think they need to be in the rabbit one, so no thanks. This is also a terrible design. 1. You are allowed to pass people, and that won’t happen with a solid line, because that means no passing. 2. Green is recognized as for bikes, so it shouldn’t be in the pedestrian lane, people will think bikes need to be over there. Just goes to show a lot of people need a refresher on the basics of the road. What they’ve done at Montrose is monumentally dumb and will never work. Just look at the three or four dirt paths already worn in by cyclists crossing straight across Montrose. During these past couple weeks the Park District put up barriers to stop cyclists from crossing. Some good samaritans promptly moved those out of the way. So then the Park District put up some “caution” tape around the barriers. Someone quickly tore those down as well. Rather than accommodate the completely reasonable way people want to use the trail, the planners tell trail users they’re wrong and try to stop them. I had hoped that kind of professional contempt for the public went out of style a while ago. Amen. It’s very poorly thought out, and no one is going to pay attention to the signs. Already it seems like every cyclist just continues on the “pedestrian” path in that stretch, at least judging by my morning commute. Already in the north trail separation, there are bikes on the ped trail and runners/walkers on the bike trail. Where the trails are parallel, keep the markings. Where the trails diverge, at least we could get consistency. Currently it’s just twice the space diluting the same problem as before. I don’t think the pedestrian path needs a dividing line at all. Me neither. The markings for pedestrian path are definitely over the top. Lack of adequate and well-signed detours is a real problem. They wouldn’t do this on the city streets when construction impacts car vehicle traffic. They are about to start working on the section north of McCormick Place and down to 31st street. Sections are too narrow for us to be able to get around, I suspect. They already effectively cut off transit at the 57th street bridge. It will soon be impossible to move around on large sections of the south side of the LFT. So slow moving quadracycles go on the turtle path? To be completely fair, CDOT is pretty terrible about posting detours when city streets are closed too. Totally agree. If you had two paths- one relatively straight and near LSD, and another more meandering and nearer the lake, why in the world would you put bikers on the longer one with 90 degree turns? And why would you push the walkers and joggers closer to LSD? the historic viaducts in the area to encourage use. from Lawrence to Foster—was the longest, most highly rated portion of the ENTIRE Lakefront Trail for user satisfaction in the 2013 Friends of the Lakefront Trail Study. The complete change-up in this stretch is baffling especially because congestion has never really been an issue. The Montrose viaduct plan preferences drivers over greener modes of lakefront access and also (ironically) puts street-like pavement right up against a reconstructed savanna. It’s a sea of asphalt next to 10 lanes of traffic! Key concerns with moving the 24-hour bike path east north of Montrose are that that route a) puts cyclists behind barriers the police use to close Lincoln Park and b) seriously degrades prior strong ADA access to the Lake and event destinations like Cricket Hill. If you are a cyclist who is challenged daily on the streets, it is easy to forget that there are people who are more vulnerable than you. But it is critical for planners to remember that you can never go wrong if you build your plan around ADA access—first. To get to the “new” bike trail you have to ride for quite a long stretch over the Wilson viaduct and then turn left just before Simonds Drive to enter a “spur” that takes you to the new trail at a point just north of the Wilson viaduct. It’s a lot of work, which is why most cyclists arriving at the Trail here just take the “new” ped route (the old Trail). If the curb you showed were made into a ramp, someone parking at an ADA space in the Wilson lot could (theoretically) reach the ‘new’ ped path. The ADA parking spaces in Wilson lot all exited onto the former east walk that has been turned over to ‘bike-only’ use, so basically if you park there and use a wheelchair, you have to ride on the bike path to get out of the lot. For better or for worse, cyclists will have to detour east to the lakefront on this stretch, and trail users will have to go through an underpass to cross Montrose.